Kobina works for Changes UK, having come to the Midlands to train as a probation officer at Birmingham University where he achieved a post graduate DipSW and an MSocSc. Kobina joined West Midlands Probation Service as a probation officer in 1996 and worked in a Birmingham field team for four years before moving to a programmes unit where he stayed for three years. During this period he became an accredited programmes tutor and trainer. He recently graduated from the Common Purpose Meridian Leadership Development Programme and was appointed to our board October 2014. Previously, Kobina headed up Walsall and Coventry Local Delivery Units before the creation of the Community Rehabilitation Company. He was also the District Manager for Community Payback for five years and this followed a short period as a Senior Probation Officer in a high risk of harm team based in Handsworth, Birmingham. His career in management has given him experience of building staff capacity, governance, partnership and relationship management, in addition to leading performance improvement. Clark Baim, PhD is a Senior Trainer in Psychodrama Psychotherapy and Director of the Birmingham Institute for Psychodrama, a training school. He is currently the Honorary President of the British Psychodrama Association. In his other work, Clark is the Co-Director of Change Point Learning and Development, an organisation focusing on training in social work, criminal justice, mental health and educational settings. He is also a faculty member of the Family Relations Institute, a training organisation focusing on the Dynamic-Maturational Model (DMM) of Attachment and Adaptation. In 1987, Clark was the founding Director of Geese Theatre Company UK, having toured with the original Chicago-based Geese Theatre in the mid-1980s and later establishing the UK Company as a sister organisation. Clark worked with Geese Theatre Company UK from 1987 – 1989 and 1992 – 2000 and joined the Board of Trustees in 2012. Iain is a chartered accountant and a partner in Smith & Williamson LLP, advising shareholders and boards on all aspects of corporate finance including raising finance, buying and selling companies and mergers. 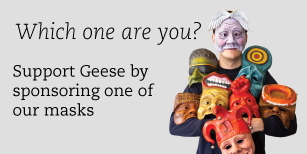 He has been on the Board of Geese since 2000 and is company secretary. Selwyn practised for 16 years as an employment lawyer, advising and training employers, their HR teams and their managers on employment law related business issues. Between 2004 and 2014, Selwyn set up and developed Employment Law + at Pinsent Masons LLP. During this time, he managed a team of up to eight people. Now as a business consultant and trainer, Selwyn draws on his experience as an employment lawyer, trainer and manager to offer risk analysis and solutions to organisations in the public and private sectors. Selwyn has been a Board Member of Geese Theatre Company since 2004 and helps the Company with its employment relationships and internal governance. He was Chair of the Board between 2009 and 2011. Janet has been Director of Human Resources for Acorns Children's Hospice Trust since July 2000 having worked for many years in HR across a range of industries including the retail, finance and engineering sectors. She has broad experience in all areas of people management with particular interest in strategic HR, learning and development and organisation design. Recently qualified as an MBTI practitioner strengthening interests in career development and coaching. Janet is a Fellow of the Chartered Institute of Personnel & Development, has been a Parent Governor at Sharmans Cross School and joined the Geese Board in 2014. Pippa is an award-winning Independent Producer. She works with artists and organisations to create art that aims to surprise and delight audiences nationally and internationally. She is passionate about working in the regions to create new work of high quality, showcase new voices and grow new audiences. In 2014 she won The Mark Marvin / Peter Brook Award for her work with Birmingham Repertory Theatre. She is Festival Producer at the internationally renowned Fierce Festival, a co-director of well-loved regional work-in-progress platform PILOT Nights and a visiting lecturer at The University of Birmingham and Birmingham Conservatoire. She has a vested interest and track record in telling diverse stories, and creating space for marginalised artists and voices. Before developing her producing portfolio Pippa worked for Women & Theatre, as a Programmer at the Drum Arts Centre; and was Project Manager of The Decibel Performing Arts Showcase 2007 and for Fierce Earth.